2210, Used Rims,16X6-1/2, 5 LUG, 100mm, 03-06, CHRYSLER, SEBRING, SDN & CONV, GTC, 9 SPOKE, EXPOSED LUG NUTS, SPARKLE SILVER PAINTED, ALLOY. 2210, Used Rims, 16X6-1/2, 5 LUG, 100mm, 03-06, CHRYSLER, SEBRING, SDN & CONV, GTC, 9 SPOKE, EXPOSED LUG NUTS, SPARKLE SILVER PAINTED, ALLOY. 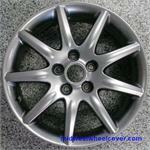 2211a, Used Rims, 16X6-1/2, 5 LUG, 114mm, 04-07, CHRYSLER, TOWN & COUNTRY, 9 SPOKE, MACHINED FINISH, ALLOY. 2211b, CENTER CAP USED, 04-07, CHRYSLER, TOWN & COUNTRY, SMOOTH CHROME WITH SILVER & CHROME CHRYSLER LOGO. 6 PLASTIC CLIPS & WIRE RING, 6-1/4" DIA. 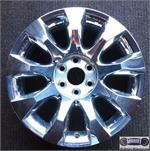 2211b, Used Rims, 16X6-1/2, 5 LUG, 114.3MM, 04-07, CHRYSLER, TOWN AND COUNTRY, 9 SPOKE ALUM, CHROME FINISH. 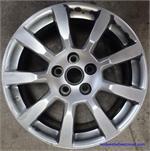 2270, Used Rims, 16X6, 5 LUG, 100 mm, 06-10, CHRYSLER, PT CRUISER, SILVER PAINTED, 9 SPOKE, ALLOY. 2401, USED RIM, 17X6-1/2, 5 LUG, 5", 11-13, CHRY, TOWN & COUNTRY, ALUM, 9 SPOKE, PAINTED SILVER. 3502a, Used Rims, 17X7, 5 LUG, 4-1/2, 03-05, LINCOLN, TOWN CAR, ROAD WHEEL, 9 SPOKE, CHROME, GROOVED, POLISHED. 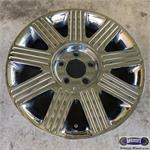 3502b, Used Rims, 17X7, 5 LUG, 4-1/2, 03-05, LINCOLN, TOWN CAR, ROAD WHEEL, 9 SPOKE, CHROME, GROOVED, TEXTURED. 3804, Used Rims, 17X7-1/2, 5 LUG, 4-1/2", 10-11, LINCOLN, MKZ, ALUM, 9 SPOKE, CHROME CLAD. 4018, Used Rims, 17X7, 5 LUG, 115MM, 06-08, BUICK, LUCERNE, ALUM, 9 SPOKE, CHROME. 4018, Used Rims, 17X7, 5 LUG, 115MM, 06-08, BUICK, LUCERNE, ALUM 9 SPOKE CHROME. 4025, USED RIM, 17X7-1/2, 5 LUG, 115MM, 06-08, BUICK, Lucerne, 9 SPOKE ALLOY, MIDNIGHT SILVER PAINTED FINISH. 4037, USED RIM, 16X6-1/2, 5 LUG, 115MM, 00-02, BUICK, PARK AVE, BRUSHED, ALUM 9 SPOKE. 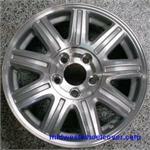 4528, Used Rims, 16X7, 5 LUG, 115MM, 96-97, CADILLAC, SEVILLE, ALUM 9 SPOKE CHROME FINISH. SEVILLE, ALUM 9 SPOKE CHROME FINISH. 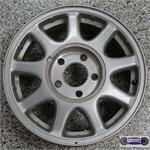 4528, Used Rims, 16X7, 5 LUG, 115MM, 96-97, CADILLAC, SEVILLE, ALUM 9 SPOKE CHROME FINISH. 4627, USED RIM, 18X8-1/2, 5 LUG, 5-3/4", 08-09, CADILLAC, CTS, POLISHED ALUM 9 SPOKE. 4628, USED RIM, 18X8-1/2, 5 LUG, 4-3/4", 08-09, CADILLAC, CTS, ALUM, PAINTED, 9 SPOKE. OPT P75. 5060, Used Rims, 15X6, 5 LUG, 115mm, 97', CHEVY, MALIBU, SPARKLE SILVER 9 SPOKE ALUM. 55048, HUBCAP USED, 16", 99-01, HONDA, ODYSSEY, SPARKLE SILVER, 9 SPOKE, ETCHED H LOGO, 5 LUG NUT HOLES, ANTI-RATTLE PINS, HELD ON BY LUG NUTS.